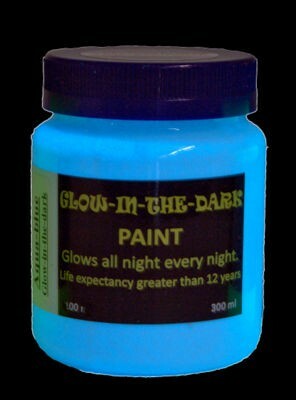 Glow-in-the-dark Paint for Interior and Exterior Applications. Charged by light and then glows in the dark for 12 hours. Highly durable: Life Expectancy exceeds 12 years in exterior environments and 20 years in interior applications. There is no limit to the number of charge cycles that the paint can undergo. As long as the durable paint is in good condition it will continue to charge and glow as it did when new. GID Aqua-blue glows a beautiful light blue color in the dark but does not glow as brightly as GID Green. It is used for decorative applications (for safely application we recommend GID Green).. It charges in light then glows for 12 hours in the dark. In normal light the paint is an off-white, pale green color and then glows in the dark. Always paint Glow-in-the-dark Paint onto white colored surfaces to get a good glow so if necessary paint the surface white with a good quality acrylic/PVA wall paint first. Bear in mind that many outdoor environments are not dark at night due to street lights, exterior house lights and even moon light (when full moon). If the area is not dark then the glow result may not meet your expectations. If you have seen pictures of "glow paint" on plant pots or pathways and the glow looks as bright as a light then the pictures are not of glow paint; they are either edited pictures or the items have battery operated LED lights under the surface. If our paints could do this then they would have replaced electrical lights in many applications. This is a thick (high viscosity) paint and works best if two thick coats are applied. 1 Litre paints approximately 4m2 per coat (about half the spread rate of normal wall paint). Usually applied with brush or roller but airless spray can also be used. We have seen excellent, very uniform, results when sprayed with airless spray. As the paint is thick it is quite likely that brush or roller marks will remain. These are, however, not visible when the paint is glowing. Some dilution with water prior to use will reduce the brush and roller marks but after dilution the active particles will tend to settle so regular stirring may be required. You will get a better result thinning the paints with our Flow Control. This can be found under product category "Marbling and Pouring Art Acrylics". Prepare and Prime surfaces as for normal acrylic paint. If in doubt contact us or see Preparation and Priming on the Technical Page of this website. In addition to normal priming remember that these paints should be painted onto a white coloured surface to get the best glow. If priming is required and the primer is not White then paint over it with a normal (high quality) white wall paint first.